Just working on the new design for the beach. I’m trying to capture the landscape of Kauai and the beaches of Isla del Coco. Kauai is of course where Jurassic Park was filmed and features those iconic cliffs and mountains, and Isla del Coco is the real life island that Trespassers version of Isla Sorna is based on. 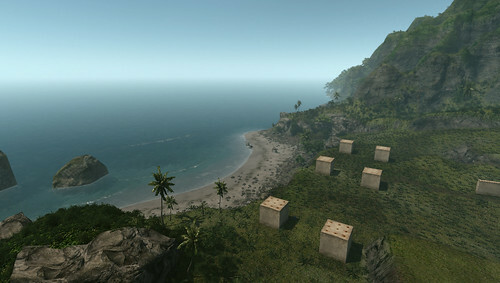 It has some nice volcanic looking beaches, with lots of rocks and minimal vegetation. Its a nice contrast to the bright lush landscapes of Kauai and i think works well for Trespasser. The off shore rocks are from Trespasser and are just temporary for now, ill replace them with either a new model or some voxel terrain. I’m not sure i’ll keep the rocks at all yet, as the blue coral reef looks really nice. Time will tell. A full size Rex is on the beach for scale and the tail of the plane is down there too, scaled up to a more realistic size. I’m aiming for a detail level between Stage 1 and the high detail island from the flythrough video. Rather than keeping the levels exactly as they were, I’ll fix a lot of the issues as i go, cleaning up roads, smoothing out blocky terrain and spreading out patchy vegetation. I still have lots of vegetation and objects to add yet, right now im just trying to establish a theme i can run with and then move onto the more open plain areas. Once i have a look nailed down for the beaches, jungles and open plains for the islands south, i’ll move north and start working on the pine and redwood forests. Then i’ll come back through and finish everything off. ~ by newoldmate on 23/05/2015. I liked the jungly look older shots had. I’m disappointed as well, but you’ve got to remember that this is only the beginning stages. It’s supposed to look mostly like the original and will look like it did in the flythrough later on. So keep your hopes up, I know I am! I know it might be a little late to ask this, but I’ve always wondered: Why is the only piece of wreckage from the plane on the beach the tail? Looks good by the way! Of course there would be negative comments. I dont know why i bother writing “not finished” and “still lots of vegetation and objects missing”. And people wonder why id software have held off showing screenshots and footage of the new Doom. Well, I thought you said ‘minimal vegetation’. I was just worried, that’s all.